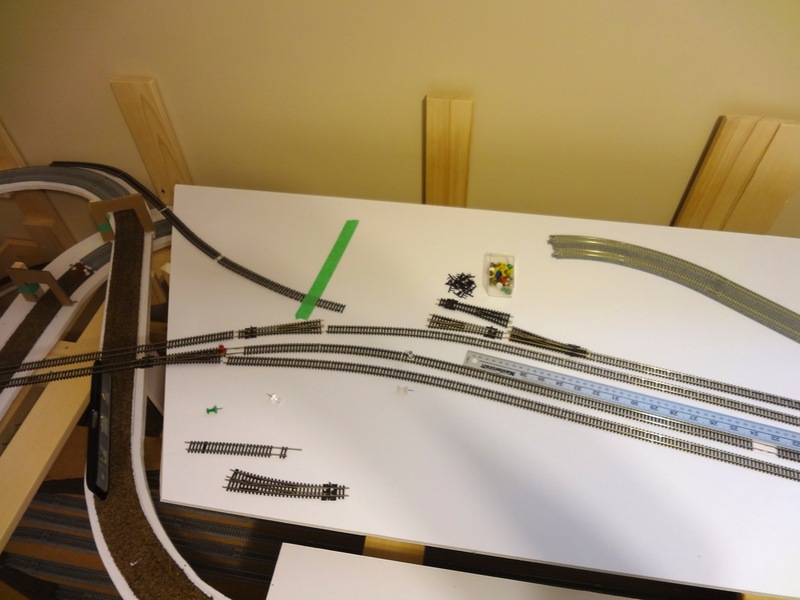 With the helix complete on my N-scale layout it was time to start putting in the risers and sub-roadbed for the main line up to the Hauptbahnhof level. 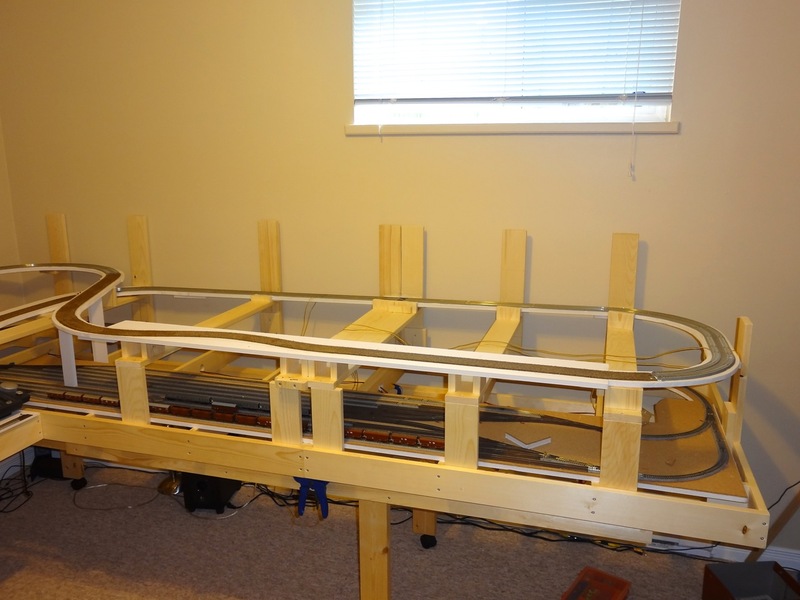 For the most part the risers supporting the sub-roadbed will be the same lightweight SPF 1x4 wood that the layout frame is made of. For stability they are all screwed into the main layout frame where possible. Over the lower staging yard, I used risers at the front and back of the layout and then added 'bridge' pieces over the yard to provide the best access to the trains in staging. Along the back of the layout I used tall support rises that would be approximately the final height of the branch line track. Some may have to be carefully trimmed later on but it is easier to cut off than graft additional height on. The sub-roadbed is the same 1/2 inch gatorboard that the lower staging yard was built on. I had a rough track plan mapped out on paper to make sure the grades did not exceed my maximum of 2.5% but most of the sub-roadbed cutting was simply trial and error. If I hit a tricky section I used some large sheets of cardboard I had to pre-cut a section to test fit. For the most part this worked out pretty well although I had to step back and make one large change to the plan at the last minute to deal with a clearance and grade issue that looked good on paper but would make things difficult to work with. I had the make a lot of changes to work past some clearance issues. The topmost loop on the left was not in my original plan at all! Some quick tests showed that the gatorboard needed supports about every 14-18 inches for stability. I was pretty impressed with this as the lightweight gatorboard really is taking the place of heavy plywood without many compromises. In a few places where the sub-roadbed overlapped other sub-roadbed I used 3 inch wide strips of gatorboard as risers, gluing them with my favorite Weldbond white glue. Even without a solid edging the gatorboard took the glue very well and these supports turned out to be extremely solid. 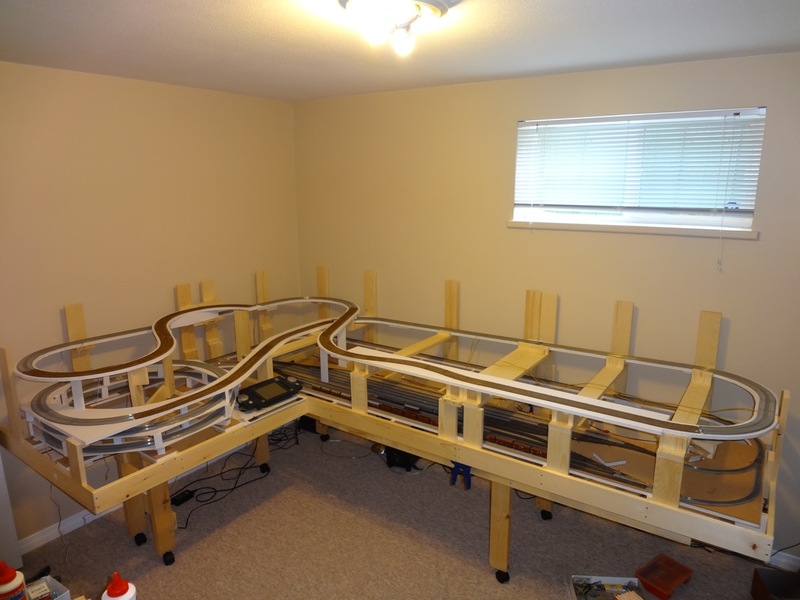 Once the risers up to the hauptbahnhof level were in place I laid the double-track Kato Unitrack for all the hidden sections. 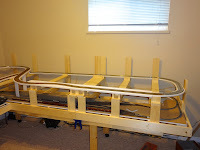 The Unitrack was secured with the same white latex adhesive caulk that I used in the helix. 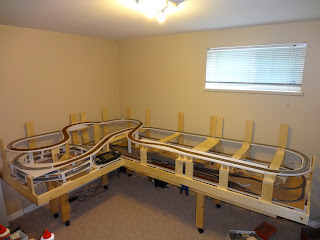 With the Unitrack down I started laying the cork sub-roadbed that the flex track for the visible areas would be attached to. I switched to using a clear acrylic caulk to attach the cork as it cured a little more rubbery than the white caulk and I hoped this would help with noise levels in the visible areas. 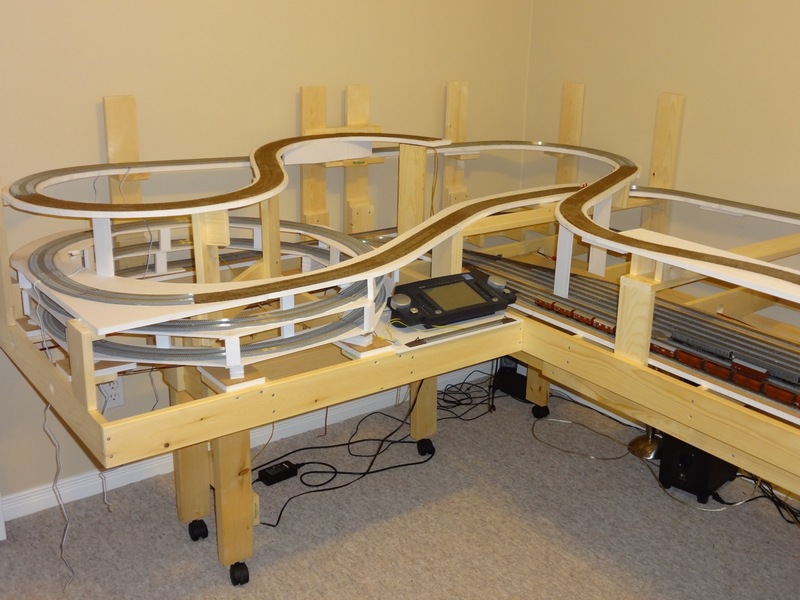 In laying all the track I really appreciated the fact I had built the benchwork on wheels so I could pull it out from the walls of the room. As I wrote earlier, the inability to get into the back of the layout was a major issue with my last layout and a big reason why it was torn up.